Boeing says the largest version of its 787 Dreamliner family is on track to make its first flight in the coming weeks, following its official unveiling on Friday (US time). 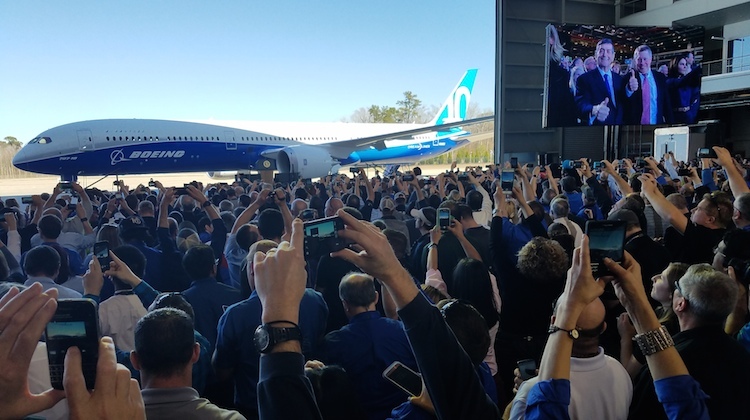 The 787-10, the third variant of the 787, was presented to employees, media and invited guests, including the US president, during the roll-out ceremony held at Boeing’s North Charleston, South Carolina facility. Following the roll-out, Boeing said the first 787-10, N528ZC, would “now be prepared for its first flight in the coming weeks”. First delivery was expected to launch customer Singapore Airlines in 2018, Boeing said. North Charleston is the location of the 787-10 final assembly line. The aircraft is the longest variant of the 787 and is capable of flying 6,430nm when configured with 330 passengers in a two-class layout, according to Boeing figures. 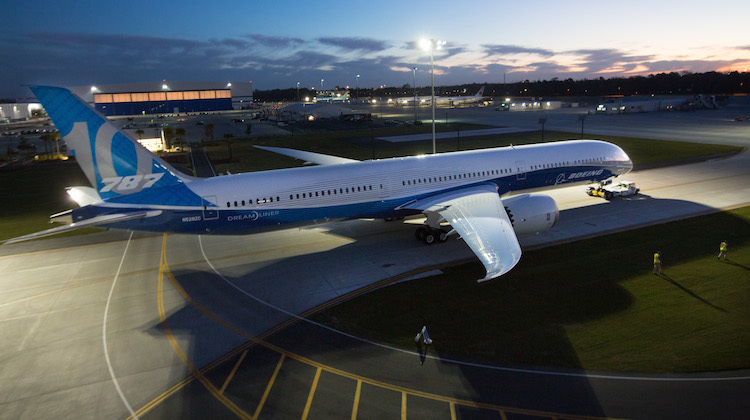 At 68.2m, the 787-10 is a 5.5m stretch on the 787-9 that began flying in August 2014. The first 787 variant, the -8, made its commercial debut in October 2011 with launch customer All Nippon Airways. The 787 features a global supply chain where parts manufactured across the globe are delivered to Boeing facilities in Washington State and South Carolina for final assembly. Boeing Aerostructures Australia, based at Fishermans Bend in Melbourne, builds components for the 787 moveable trailing edges, including the inboard flap, flaperon, outboard flap and aileron. The contract is worth an estimated $5 billion over 20 years and was Australia’s largest aerospace contract, Boeing has said previously. The 787-10 has secured 149 orders from nine customers, according to the Boeing website. “We know our customers, including launch customer Singapore Airlines, are going to love what the 787-10 will do for their fleets, and we can’t wait to see them fly it,” Boeing Commercial Airplanes chief executive Kevin McAllister said. Not sure there’ll be many middle east liveries flying into the East coast with a 787-10. Unless of course they take advantage of 5th freedom rights. Boeing B787-9/10, will be best selling tween engines aircraft in capacity above 300 seats. Hope Boeing has done something about the screaming flap motors which deafen you on takeoff and landing. Apart from higher cabin pressure helping jet lag, just another big Boeing. The 380 still the best for long distance travel. It will still have an awful 17″ 3-3-3 economy layout.